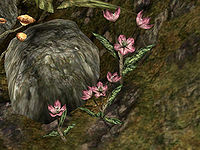 Steal five pieces of Willow Anther from Gro-Bagrat Plantation, north of Vivec. Talk to Synnolian Tunifus at the Imperial Chapels in Ebonheart for a new task. Travel to Gro-Bagrat Plantation to steal five pieces of Willow Anther. Find the willow anther on the lavender flowers in the box to the right of the front door. Return to Synnolian to complete the quest. Synnolian Tunifus at the Imperial Chapels in Ebonheart will ask you to run another errand to fetch five pieces of Willow Anther to create a Potion of Cure Paralyzation. Tunifus says that he usually steals the willow anther from Gro-Bagrat Plantation, north of the Vivec Foreign Quarter. The willow anther can be found on the lavender flowers in the box to the right of the front door (Gurak is inside, so it's relatively safe). Alternatively, you can also get the willow anther from any other source: for instance there are several willow flowers just across the bridge from Ebonheart. Return to Tunifus with the willow anther to receive a Potion of Cure Paralyzation, and a copy of The Four Suitors of Benitah (a Restoration skill book). If you fail to collect enough willow anther, Tunifus' disposition towards you drops by ten. 1 Synnolian Tunifus needs five units of willow anther for cure paralyzation potions. He admitted he steals willow anther from the flowers growing around the house of Gurak gro-Bagrat. His house is on the mainland, just north of the Foreign Quarter. 5 Finishes quest I told Synnolian Tunifus I would not be able to bring him the five units of willow anther he asked for. He was disappointed, and told me to take a day to reflect on my shortcomings, and attempt to amend them before I approach him again for a lay healer mission. 50 Finishes quest I delivered five units of willow anther to Synnolian Tunifus. He gave me a cure paralyzation potion and a valuable book as a reward. 1 Finishes quest I told Synnolian Tunifus I would not be able to bring him the five units of willow anther he asked for. He was disappointed, and told me to take a day to reflect on my shortcomings, and attempt to amend them before I approach him again for a lay healer mission. This page was last modified on 13 April 2013, at 02:25.